The US economic news last week was not all negative - in fact it was more of a "mixed bag". 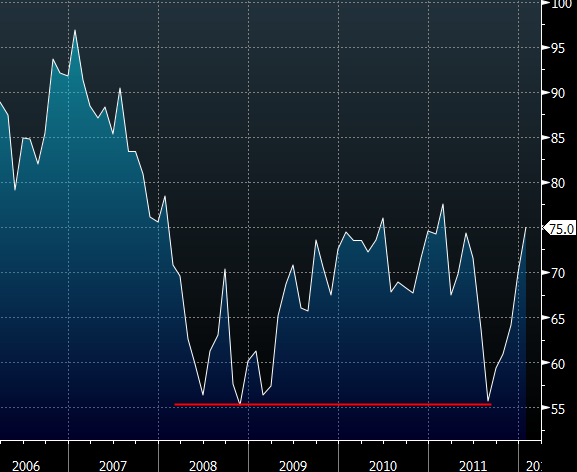 The positive news came from the U.Michigan index of consumer sentiment. Reuters: The Thomson Reuters/University of Michigan's final reading on the overall index on consumer sentiment rose to 75.0 from 69.9 the month before. It was the highest level since February 2011. The current index level takes us back to where the sentiment measure was in early 2011, before the Eurozone crisis took hold of the financial markets. One question worth considering is how did the sentiment index decline of 2011 compare to a similar period in 2008? The low point was August of 2011, a month that combined the US budget negotiations, the US debt downgrade, and the escalation of problems in the Eurozone. 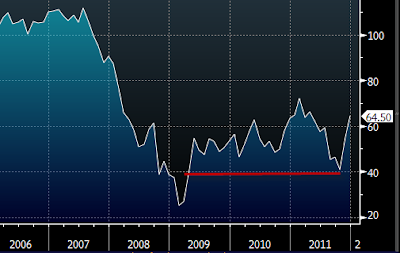 The sentiment in August was about as low as it was in November of 2008 - the lowest point of the financial crisis. This seems a bit surprising and not at all intuitive, with anecdotal evidence suggesting that 08 felt far worse than 2011. 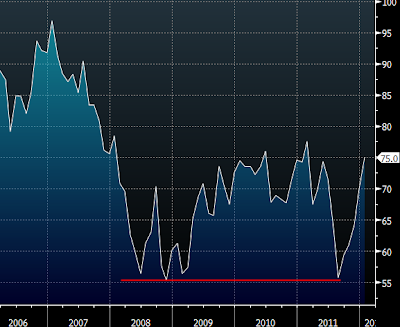 As a comparison let's take a look at another gauge of US consumer sentiment - the Conference Board Consumer Confidence Index. That index was behaving closer to the U Michigan Current Conditions component (above), with a dip that did not rival the 08 levels. Some of this difference between these two gauges of consumer confidence was pointed out back in the 80s by some OSU researchers. Researchers on index comparison: Thus, it appears that the Index of Consumer Sentiment is capturing consumer reactions to what is happening with financial related factors (e.g., prices and interest rates) and to a lesser extent, such variables as the work week, the stock market, and the employment picture. In contrast, the Index of Consumer Confidence is picking up some additional information on employment related variables, such as the length of the work weeks the accession-layoff rate, and disposable income. One therefore has to be careful in interpreting the U Michigan consumer sentiment indicator because it is a combination of current conditions as well as expectations. And when things turn ugly in the financial markets, it is more the expectations that drive the index lower, even if current conditions have not deteriorated as dramatically. Just as important is the fact that when markets improve rapidly as they recently have and the index spikes, it is driven more by expectations and not as much by a rapid improvement in current conditions of the US consumers.